It manages a family of six Funds, largely focused on North American equity markets. The JC Clark Adaly Fund is an event driven long/short equity fund that seeks to achieve attractive risk-adjusted returns across all market conditions. The Fund takes a private equity approach to public markets to compile a portfolio of 20-25 investments, which are under-covered and typically mispriced. From its inception almost 18 years ago, the Fund has generated a compound annual return net to investors of 12.5%. MedReleaf Corporation is one of the largest and most profitable licensed producers of medical cannabis in Canada. The Canadian cannabis industry is on the verge of achieving legal status akin to the tobacco and alcohol industries. The Federal government has introduced legislation to legalize the recreational use of cannabis, and has set July 2018 as the target date for Bill C-45 (aka the Cannabis Act) to be enacted. Beyond that date, however, it is up to the individual Provinces to determine how to provide for the distribution and dispensing of cannabis within their borders. Ontario has already proposed a framework that leaves it wholly in the hands of a government-controlled entity, such as the LCBO. Quebec is following the same script. British Columbia and Alberta will probably allow private enterprise to play a role. The recreational market is potentially a huge one – much larger than the medical market. Health Canada introduced the ACMPR (Access to Cannabis for Medical Purposes Regulations) in August 2016, and since then over 200,000 Canadians have registered in the program. Demand for medical cannabis is approaching 100,000 kg per annum, or over $2 billion; yet the recreational market is estimated at 750,000-1 million kg/year, or at least $7 billion. Clearly, satisfying this demand through legal channels will be a challenge – at least for the next few years. Seeing this opportunity has spurred almost 2,000 applications for licenses under the ACMPR. Most of these applications will be turned down, or never be completed, but to date over 50 licenses have been issued and hundreds more are in the queue. First mover status has definitely been an advantage in raising capital, achieving scale, and penetrating the medical community; but much like the craft brewing industry, there will be a place for smaller niche producers in the recreational market. The Federal government (through the PBO) has done studies to determine how large the illicit market is, and its pricing, in order to recommend a legalized pricing regime that allows for a reasonable level of Federal and Provincial sales tax, as well as an acceptable margin for producers. Based on the evidence, it appears that producers might be able to charge a wholesale price of $4-$6 per gram, which still allows for a healthy gross margin of 60%-70% for the more cost-efficient. However, this compares to current gross selling prices of $8-$9 per gram when selling into the medical market. It is our belief that the medical market will continue to exist in parallel with the recreational market, which will allow those LPs focused on medical cannabis to maintain comparatively higher margins. There are risks to investing in this burgeoning new industry – both macro and micro. From a macro perspective, Canada’s move to fully legalize cannabis is in contravention of international treaties it signed decades ago. The repercussions are indeterminable, but Uruguay did the same thing four years ago and nothing happened. Another question mark is the timing of provincial roll-outs and what they will look like – province by province. The recreational market is well-served currently (an estimated 20% of all Canadians age 18 or over are users), and transitioning away from traditional sources of supply could be more gradual than the industry is betting on. Interestingly, a recent study published by Deloitte has asserted that 17% of Canadians might try marijuana if it were legalized, bringing the potential market size to just under 40% of the population. On a micro level, individual producers are facing an uncertain pricing and taxation environment, as alluded to earlier. But they also face operating risks, such as crop yield, infestation, recalls, and reputational risk should they fall short on quality, consistency, or deliverability. The cannabis community is a tight-knit one, and once a producer falls from grace for any reason, it could be hard to win back fans – especially with so many alternatives available. Another limiting factor is branding, which has not been fully spelled out, but one can assume that marketing one’s products will be constrained as much as the Canadian tobacco industry is. Ultimately, this limitation again favours first movers, who will be in a better position to strike wholesale deals with the major dispensaries (be it pharmacies, government-controlled entities, or large independents), in addition to their ongoing efforts to develop credibility with the prescribing medical community. Since 2014 over $1 billion in capital has been raised to fund the build-out of this “new” industry. Most of that money has gone into acquiring land, and constructing or retrofitting facilities, which are a combination of greenhouses and indoor manufacturing. The former are cheaper to build, and theoretically cost less to run. The latter offer greater control over climate, infestation, and product consistency. Time will tell whether or not these distinctions persist, but at this juncture it seems that greenhouses are targeting the broader recreational market, and indoor facilities the high-end and medical markets. One of the most bullish developments within the cannabis space is the rapid take-up of extracts (or oils) – as opposed to smoking dried bud or “vaping” (inhaling a vaporized e-liquid or dried plant). Oils can come in capsules or vials (with a dropper), and appeal to those users who don’t want to inhale (be it nicotine or an aerosol). More kilograms of cannabis oils are now being sold than dried bud (or flower), and this is particularly meaningful because, on a per gram equivalent basis, oils sell for a much higher price than dried bud. In fact, it can be argued that the recreational cannabis market is potentially even larger than assumed because many Canadians don’t like smoking, period, including cannabis. But in another form – such as a simple soft-gel capsule with the dosage and chemistry clearly spelled out – that resistance goes away. Though scientific evidence supporting the efficacy and safety profile of cannabis – as opposed to opioids like Fentanyl and OxyContin – is compelling, it is shorter term and covers a smaller patient base than the medical community is used to. The major pushback is that the long-term effects of continuous cannabis use are unknown, and there isn’t enough clinical data. A cynic might argue that much clinical data is funded by large pharmaceutical companies in support of their own products. The opioid crisis is largely the result of big pharma convincing doctors to prescribe them for all manner of ailments and afflictions. Data indicates that 15% of all Canadians are on opioids. Overdose deaths have quadrupled this decade, and more people die from opioid overdoses than cocaine and heroin combined. So there is definitely a place for cannabis as another modality of treatment. It has been found to benefit Childhood Absence Epilepsy at one end of the age spectrum, all the way to seniors dealing with Alzheimer’s or in palliative care, at the other. In between, it alleviates pain, inflammation, sleep disorders, anxiety, and PTSD (post-traumatic stress disorder). Over time, the stigma associated with cannabis will no doubt recede, prompting more insurance coverage, more prescribing doctors, and more consumers to view it as a legitimate alternative to alcohol and other more pernicious narcotics. MedReleaf Corporation (LEAF) is one of the largest and most profitable LPs (licensed producers) of medical cannabis in Canada. 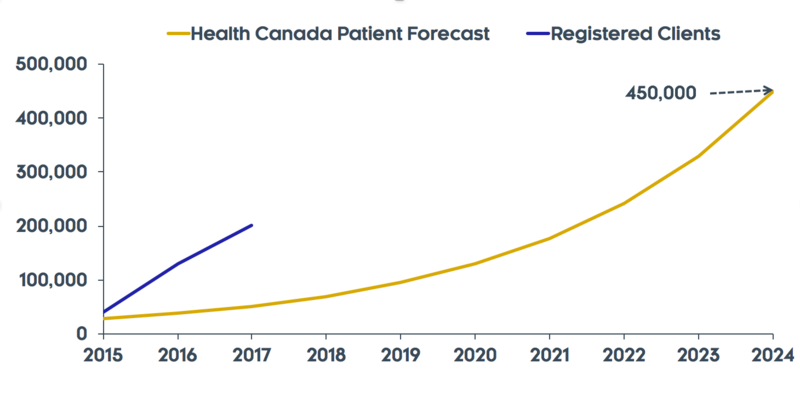 It holds an approximate 20% market share based on volume shipped, which has remained fairly constant since its inception, despite the near-quadrupling of licenses awarded by Health Canada over this time frame. The Company’s diverse offerings of award-winning strains and premium-priced, high THC and CBD concentrated flower, coupled with industry leading cash production costs per gram, have contributed to MedReleaf enjoying the highest operating margins in the business. The Company was founded in February 2013 and received its licenses to produce and sell medical cannabis from Health Canada under the MMPR program in February 2014. Shortly after the Company’s founding, MedReleaf forged a strategic relationship with Tikun Olam of Israel. Tikun Olam was the first company approved by the Israeli government to produce and sell medical cannabis and it is currently the largest producer in the country. 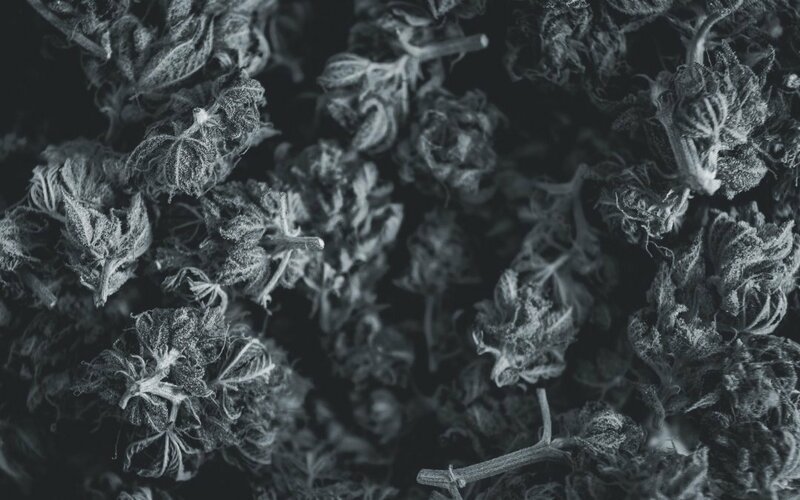 The MedReleaf/Tikun Olam alliance provides LEAF with the exclusive Canadian rights to a catalog of proprietary strains, in return for a small royalty on net revenues. Additionally, Tikun Olam’s extensive database comprising years of patient treatment, analysis and feedback has been extremely beneficial in educating physicians as well as assessing and treating patients’ needs. MedReleaf presently operates a 7,000 kg/yr facility in Markham, Ontario and is in the process of building out its Bradford, Ontario facility, which will scale to approximately 28,000 kg/yr once fully operational in the summer of 2018. Bradford’s present output is approximately 2,800 kg/yr, but upon its completion LEAF will be a top 3 producer in Canada, with combined capacity of 35,000 kg/yr. Markham’s cultivation space consists of 10 grow rooms, while Bradford will host 19 grow rooms once completed. The Company’s first mover status, near-flawless execution, and industry leading ROIC will provide it with a material competitive advantage in winning large wholesale contracts with pharmacies, as the medical market evolves, and with provincial distributors, upon the legalization of the recreational market in July 2018. Brand awareness, ability to scale production, consistency of product and stringent QA/QC controls, including being the only ISO and GMP certified LP in the country, will be pivotal in procuring wholesale and distribution contracts. We believe that MedReleaf is one of the very few Canadian licensed producers that can check off all these boxes. In mid-2015, Health Canada approved the addition of cannabis oils and oil capsules under the MMPR. MedReleaf obtained its cannabis oil production license in late 2016 and was the first licensed producer to begin selling hard capsules containing cannabis oil. The Company is presently awaiting final approval from Health Canada to sell soft gel, oil-filled capsules. Once approved, MedReleaf will be one of only two companies in Canada licensed to produce and sell soft gel capsules. 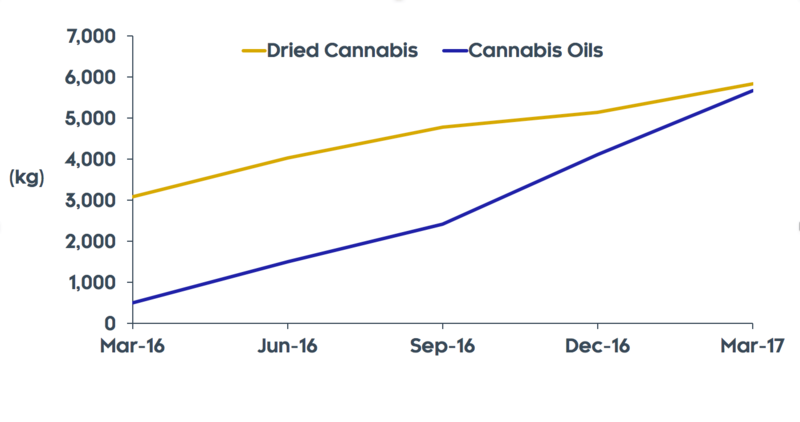 The significance of this license should not be understated given the fact that the growth in cannabis oil sales has dramatically outpaced that of dried flower over the last 5 quarters. Additionally, less than half of all LPs have a license to produce and sell oils, thus resulting in a more favourably skewed supply/demand equation for oils as compared to dried flower. In the two years since the approval of cannabis oil and oil capsules by Health Canada, oil sales have quickly grown to over 40% of industry sales. It is anticipated that oils’ share of the overall cannabis market will reach 70% in the coming years. The general acceptance of oils and oil-filled capsules are a function of consumers’ familiarity with the delivery methods employed and physicians’ comfort in prescribing cannabis in the more traditional form factor of a capsule, which provides accuracy of dosage. It should also be noted that the use of oils as a modality of treatment relieves physicians from having to prescribe their patients a product that requires them to inhale a carcinogen. Despite receiving its license to produce and sell oil and oil-based products in late 2016, the Company took a very cautious and methodical approach to marketing its oils and hard-coated capsules. This has resulted in MedReleaf presently having a lower exposure to oil sales when compared to the majority of its peer group. In the most recently reported quarter, oils represented just 14% of total sales. 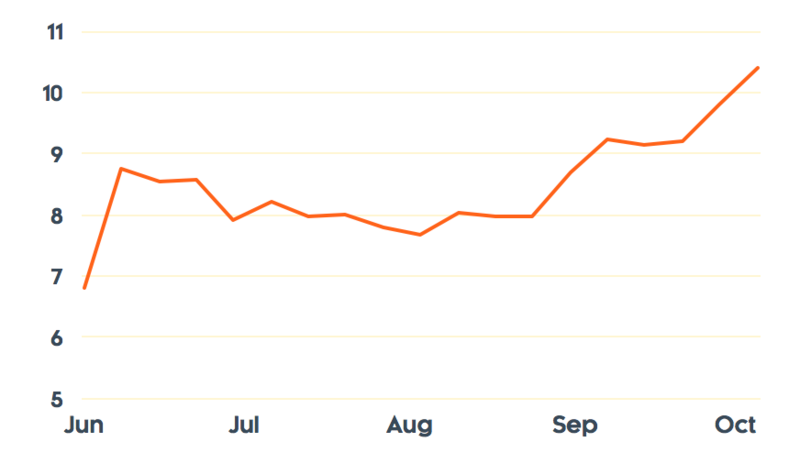 By the end of June, the sale of oils was up to 23%, and it continues to increase on a monthly sequential basis. MedReleaf’s increasing exposure to oils and oil capsules will enable the Company to gain exposure to a broader market. And, all else being equal, it should ultimately lead to increased operating margins, as a result of the premium price charged for oil products as compared to dried flower. 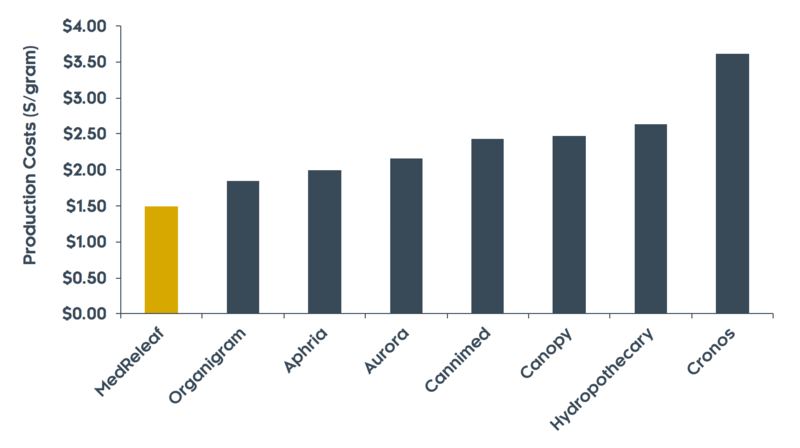 As per the MD&A from their most recent quarter, MedReleaf receives a 35% premium for its oils compared to dried flower, on a gram-equivalent basis. Additionally, MedReleaf uses trim (i.e. plant trimmings) in the oil extraction process, so its production cost should be less than dried flower on a gram equivalent basis, while extraction, bottling and the cost of capsules is relatively modest. Since its inception, MedReleaf has taken a data-driven approach to building its business. It has emphasized the “science” behind cannabis production, compared to many of its peers which have described it as more of an “art form”. MedReleaf’s differentiated approach is evidenced by its large team of PhD’s and Masters-educated employees focused on genetics, cultivation techniques, research and development, and patient data. The Company’s focus on the numbers has resulted in MedReleaf achieving industry-leading crop yields that are more than double the industry indoor average. Specifically, the Markham facility is currently realizing 300g/square foot per year of production compared to the average indoor facility doing approximately 140g/sf, and many times more than the average greenhouse producer that achieves yields estimated between 50g-60g/sf. Management claims that there is even more upside to its present yields, as it is constantly monitoring and tweaking the seven key variables in its rigorous growing process: temperature, humidity, carbon dioxide, light, nutrients, pruning and plant formation. Over the past 2-3 years, we have learned as much as possible about the business of producing and selling cannabis, and in the process have met with numerous publicly-traded and many privately-owned medical cannabis companies. All of them assert that they will be increasing their production exponentially in the coming months and years, and they all maintain that they will achieve sub-$1.50/gram cash costs once their facilities are fully operational. In truth, many of these companies are presently operating pilot projects of uneconomical size, and their expansion plans entail the construction and operation of a facility that differs materially from their existing operational footprint, in both scale and in type. It is our belief that many of these companies will fall short of their operational targets, and their guidance should be discounted accordingly. In the case of MedReleaf, however, we have a high degree of confidence that Bradford will be rolled-out seamlessly and that the cost per gram produced will continue to decline from its already low $1.49/g, given the scope and scale of the operations. The Markham facility was constructed on time and at an all-in cost of $15MM, with the expectation that it would be able to produce 4,000 kg/year of dried cannabis. As mentioned earlier, Markham in fact now produces 7,000 kg/year, without the need for additional capital expenditures. These successful achievements are a testament to the extensive experience and sophistication of MedReleaf’s management and board of directors, who are collectively highly accomplished in the realms of healthcare, finance, consumer products, distribution and logistics. MedReleaf’s patient base is a very lucrative one. While average daily cannabis consumption of all patients registered in Health Canada’s ACMPR program (it replaced the MMPR last year) is 0.7/grams, the average MedReleaf patient consumes double that. In large measure, this is the result of the company’s early focus on veterans suffering from PTSD. Late last year Veteran Affairs Canada implemented price and volume caps, which reduced LEAF’s overall revenues by around 25%, but management has done an excellent job in replacing the lost business. It has successfully added many new non-veteran patients while running a conservative sales and marketing initiative that has proven to be approximately 30% more efficient than its peer group. Continuation of this trend will lead to a re-acceleration of sales beginning in CYQ4/2017. Sales and profitability will ramp dramatically through CY2018 and CY2019, as Bradford rolls-out and the company starts to capitalize on its many new initiatives, such as soft gel capsules, topical creams, and the international export market. As alluded to earlier, we feel that it would be prudent for investors to not give many of the LPs a “hall pass” on their forward projections. Heavy discounts should be applied to their guidance on production volumes and costs. Clearly, this is a new and burgeoning industry and many of these management teams are relatively inexperienced, come from other business sectors and therefore lack the requisite experience to succeed without facing major hiccups. That said, and taking all the public LPs’ guidance at face value and applying zero discounts, MedReleaf still emerges as the 2nd-largest company based on current and projected 2018 revenues and EBITDA. It also has approximately $86MM of cash on its balance sheet, in addition to a $10MM undrawn revolver from one of Canada’s big five banks, which is more than sufficient to complete Bradford and continue to fund its R&D and international export initiatives. Despite this enviable financial profile, MedReleaf trades at a sizeable discount to its publicly-traded peer group, irrespective of the valuation metric that is applied. Our view is that this discount persists for the simplest of reasons: it is a lesser-known story that is relatively illiquid (due to high insider ownership) and thus has a limited retail following, unlike the rest of its cannabis cohorts. We are confident that this discount will eventually narrow, and MedReleaf will trade at a premium to the group, which it rightfully deserves. 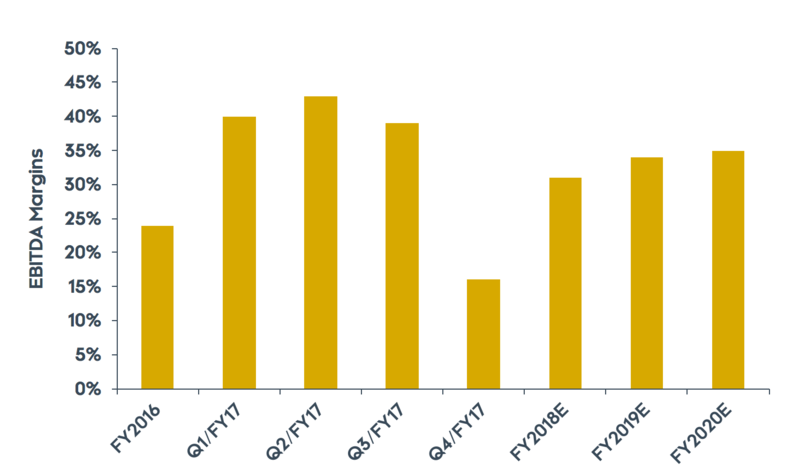 At full production and using conservative assumptions for pricing, margins and an EBITDA multiple in-line with the tobacco and spirits sectors, we derive a 12-month price target of $15-$17 per share, or roughly 60% above its current level. In the fullness of time, the cannabis industry will see a major shake-out – there will be many disappointments and some failures. Only a handful of companies will truly be successful. Our view is that MedReleaf will maintain its status as an industry leader, and ultimately emerge as one of the true winners in this rapidly evolving high growth business.